A tax deduction is an expense that we can subtract from our income before paying taxes on our income. For example, if I earn $100,000 per year, and I have a $10,000 tax deduction, I would only have to pay income taxes on $90,000. Taxpayers can either itemize individual tax deductions (such as qualified home mortgage interest and property taxes), or they can take a “standard deduction,” which is a flat amount. In 2019, the standard deduction is $12,200 for single taxpayers $24,400 married taxpayers who file a joint tax return. 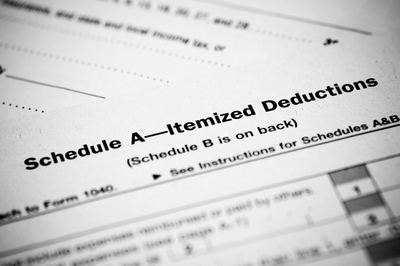 The rather large standard deduction amount means that few people are likely to itemize their tax deductions. Generally, if all my itemized deductions added together are more than my standard deduction, I would probably choose to itemize. However, if all my itemized deductions (including qualified home mortgage interest and property taxes) are less than my standard deduction, I may as well just take the standard deduction… there’s probably no need to itemize in that case. Be sure to check with a CPA for more details about how this may impact your specific situation. PLEASE NOTE: THIS ARTICLE AND OVERVIEW IS PROVIDED FOR INFORMATIONAL PURPOSES ONLY AND DOES NOT CONSTITUTE LEGAL, TAX, OR FINANCIAL ADVICE. PLEASE CONSULT WITH A QUALIFIED TAX ADVISOR FOR SPECIFIC ADVICE PERTAINING TO YOUR SITUATION. FOR MORE INFORMATION ON ANY OF THESE ITEMS, PLEASE REFERENCE IRS PUBLICATION 501.